I love that my job, and those that I work with, have direct involvement with young kids in a our preschool classroom setting. To build a classroom culture that fosters kindness, respect and self-control is just as important as teaching our young students how to recognize their colors, shapes and letter sounds. 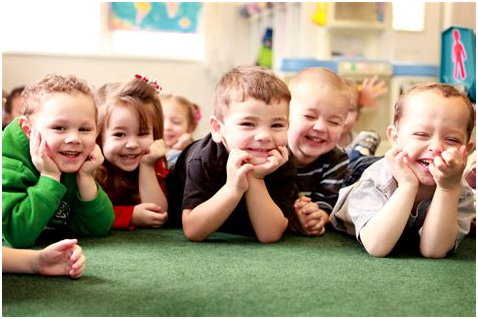 As clearly addressed in countless studies and articles, such as “The Death of Preschool” (click HERE for article) in the Scientific American, our preschoolers need to spend more time in play-based learning in preschool for better academic success in primary school. Which is great! A play-based curriculum allows more time for teachers to work one-on-one and hands on with our students. This, in turn, allows us to spend more time coaching our preschoolers on proper peer to peer communication, making good decisions and being kind to others. But, how do we actually do this? Each classroom is a little different in their day to day procedures, but as a general rule we have 3 guidelines that help us build a culture of kindness and a classroom family! As part of a classroom family students benefit from having a responsibility. It helps them t know they are important and that they belong. Having a rotating job each week is one way we give them an opportunity to be responsible in the classroom. Classroom jobs vary from line leader, door holder, electricity monitor, lunch time helper and teacher’s helper…the all-time favorite! Jobs rotate each week with each child having a job each day. Our positive behavior system includes rewards for individuals as well as the class. Our goal is to motivate our students to demonstrate appropriate classroom behaviors. At this young age, children tend to be more extrinsically motivated, and so rewards such as stickers, stamps or a visit to the treasure box go a long way! We also motivate our children to work together as a class to achieve such things as a popsicle or pizza party for consistently demonstrating positive behaviors over a length of time.. These gentle reminders of rewards reinforce positive behaviors and lead to an overall reduction of negative behaviors that take time away from learning. At K2 Campus we know teaching your child is more than ABC’s and I23’s; it’s about character development too! If you’d like to learn more about our preschool programs, please call us at 281-655-7272 to schedule a tour, or email us at frontoffice@k2academy.com. Next Next post: It’s here! It’s here! Ninja Parties are here!